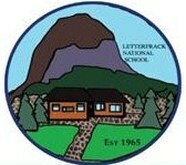 It is my pleasure as Principal to welcome you to the Letterfrack NS website.We are very proud of our school and the pupils in it. Our rich, broad and balanced curriculum gives each child the opportunity to reach their full potential academically and socially. Our children work hard, have fun and enjoy school. Here in Letterfrack NS we strive to provide a happy, friendly and caring environment, where children feel secure and valued. Parents and visitors are always welcomed into our school. We value the importance that parental and community involvement plays in enhancing our children's education thus enriching the life of the school. We hope this website will give you an insight into our school life.